Local and national sports events of the weekend, including interviews. Illinois Governor Bruce Rauner wants to sell the James R. Thompson Center in Chicago's Loop, noting it will bring in big tax revenue for the city - but there's a glitch. Mayor Rahm Emanuel said Tuesday that he won't stick Chicago taxpayers with the bill to rebuild the CTA station there. The state is already looking to relocate those who have offices at the Thompson Center, but there are zoning issues to be settled, and the big headache of determining who will pay for moving the Lake Street CTA stop that is a major transportation center in the Loop. The man who manages the state's buildings, Illinois Department of Central Management Services director Mike Hoffman said he believes developers see many possibilities. 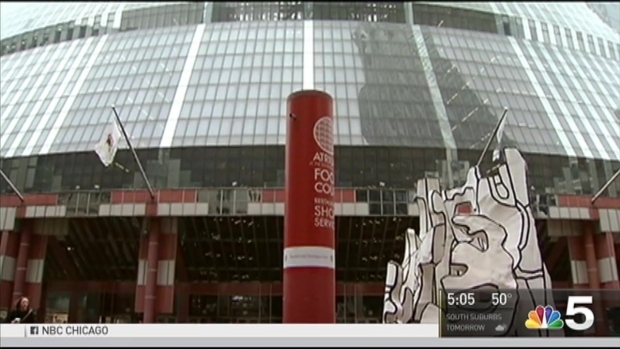 "The site, as it currently is, is very underutilized by the Thompson Center," Hoffman said. "The footprint there is only about a million square feet, we think the site is suitable and it would be well suited by about 3 million square feet." Illinois Governor Bruce Rauner wants to sell the James R. Thompson Center in Chicago's Loop, noting it will bring in big tax revenue for the city - but there's a glitch. NBC 5's Mary Ann Ahern reports. If the building is sold, the benefits to the taxpayers would not be just the one-time $300 million price tag, he said - but the future property taxes as well. "If we maximize the development in the way that we've conceived of at 3 million square feet, it could be over $40 million a year in additional property tax revenue for the city," Hoffman added. However, zoning questions still linger and Emanuel insists that the cost of reloating the CTA station be settled, which he estimated Tuesday could run between $80 and 120 million. "I am not gonna let the state have a short term, couple of hundred million and then stick the Chicago taxpayers with 100 million," Emanuel said Tuesday. But the state maintains that the issue with the CTA station is manageable. "The CTA and the city and the state and commercial developers have dealt with challenges as big as this or greater," Hoffman said. Illinois House Speaker Mike Madigan is among those who want the CTA issue settled before legislation is drafted. Democratic candidate for governor Bob Daiber, from downstate Madison County, said he sees the impasse over the Thompson Center as yet another example of the state's political dysfunction. "How do we come together on this, you know what are our differences?" Daiber asked. "Let’s just resolve this and move on. That’s why I said, I think the general public looks at some of this as just political nonsense." A spokesman for Rauner said Tuesday that Emanuel is trying to distract from the real issue, which is that the city is being "greedy" and trying to extort state taxpayers for more money than what the property is worth.